Massey Ferguson is set to relaunch the brand into Eastern Europe with a new product line-up of tractors, harvesting machinery and materials handling equipment. “The huge agricultural potential of Eastern Europe’s land assets is generating significant demand for farm machinery, and Massey Ferguson is in a strong position to support the region’s farmers with our renowned range of easy-to-use, highly-efficient dependable equipment,” says Richard Markwell, Massey Ferguson Vice President and Managing Director Europe, Africa and Middle East (EAME). Spearheading the range of new Massey Ferguson products to be introduced into Eastern Europe is a comprehensive line of tractors, covering the dairy, livestock, mixed and arable farming segments, together with combine harvesters, balers and telescopic handlers. These machines will be sold and supported through Massey Ferguson parent company, AGCO’s network of professional dealers throughout the region. 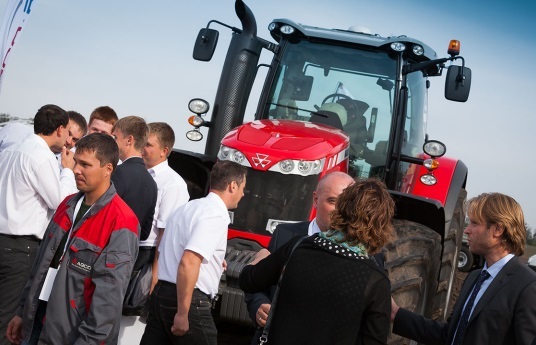 Alongside AGCO’s other key agricultural equipment brands, this will provide Eastern European farmers with an unrivalled choice of farm machinery products. Massey Ferguson is one of the best known names in agricultural equipment and a pioneer of some of the most important breakthroughs in the industry including the tractor three-point linkage, the self-propelled combine harvester, Electronic Linkage Control and yield mapping. In the last five years, the brand has completely renewed its entire product line and over $200 million has been spent on new product development and technology. Most recently, Massey Ferguson was the first to fit the low-emission, fuel-efficient Selective Catalytic Reduction (SCR) engine to tractors, while its combine harvesters are setting the pace for levelling systems. More than 200,000 tractors bearing the MF ‘Triple Triangle’ marque are built at factories worldwide each year including Europe, North and South America and Asia. In Europe, the brand’s tractors are produced in Beauvais France. Combines are manufactured at Breganze in Italy. The Breganze combine plant has recently been the subject of major investment which has included the complete reorganisation of the supply chain and production process. At Beauvais - the largest producer and exporter of farm machinery in France - the latest investment of $20 million saw the start-up of a brand-new dedicated tractor cab production facility just a few weeks ago. Among the products Included in the new Massey Ferguson line up for the EE region are the 120 hp MF 470 Xtra tractor - aimed specifically at dairy, mixed farmers and for transport fleets - plus the MF 9000 series telescopic handler. In addition, MF 3600, MF 5400, MF 7600 and MF 8600 tractors will be available covering the 69 –370 hp power spectrum, together with a selected range of Massey Ferguson harvesting products, including the award-winning MF combine harvester line. “We are very excited about our new initiatives in Eastern Europe and look forward to partnering the region’s farmers in the continuing development of profitable and sustainable agricultural enterprise,” concludes Richard Markwell.